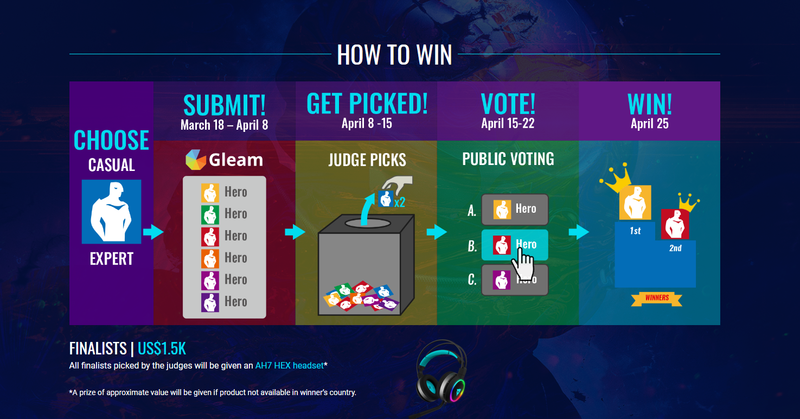 Choose your category level – expert or casual – and show us your RGB (meaning multicolored) hero from March 18 to April 8, 2019. Our judges will pick the best entries from April 8-15, 2019. All these finalists selected by the judges will be given a brand new ThunderX3 AH7 HEX Gaming Headset. You guys will have the power to vote among all the finalists on who should win beginning April 15 until April 22, 2019. The four winners will be announced on the week of April 25, 2019.Promo is open to participants worldwide. 1. Edit an RGB theme into your existing “hero” art OR create a new hero from scratch! 2. Choose your hero’s name from our list, download the art frame, and frame your work. Not an expert in graphic design? No problem. Join our super easy CASUAL category instead. 2. Pick the 5th most recent photo. This is your hero! 3. Choose your hero’s name from our list and download the picture frame. 4. Place the frame over your photo using eZY Watermark lite (iOS) or Add Watermark (Android).